A South African woman has in recent days filed a criminal complaint against Zimbabwe’s first lady, who was recently visiting the country for health treatment. Gabriella Engels, a 20-year-old model, said she was assaulted by Grace Mugabe in an upmarket hotel in Johannesburg. South African police opened an investigation into the incident and requested Grace Mugabe hand herself in for questioning. (At one point, South African Police Minister Fikile Mbalula claimed that Zimbabwe’s first lady had surrendered to police, before later being corrected.) But as of Wednesday, she has not given herself up to police, and her location remains unknown. The timing couldn’t be worse for Mugabe, who is due to travel to South Africa in the coming days for a conference of the Southern African Development Community (SADC), a regional economic grouping—and his wife is due to go with him. Neither President Mugabe nor the first lady has publicly commented on the allegations, but there are indications that the Zimbabwean government is trying to strike a deal with its South African counterparts. 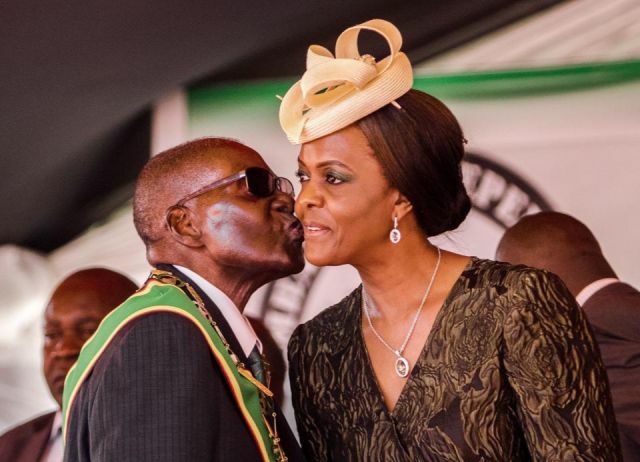 Grace Mugabe has remained off the radar since the alleged incident took place Sunday. Engels claimed she was visiting Robert Mugabe Jr. and Chatunga Mugabe—two of the Mugabe sons who live in South Africa—at the Capital 20 West Hotel. She said she was in a separate room from the Mugabe sons when Grace Mugabe entered and assaulted her using an extension cord. The incident sparked strong reactions in both countries. South Africans called on their government to prosecute Grace Mugabe, while Zimbabweans criticized the first lady for her actions.